How Can You Help Me With Money? 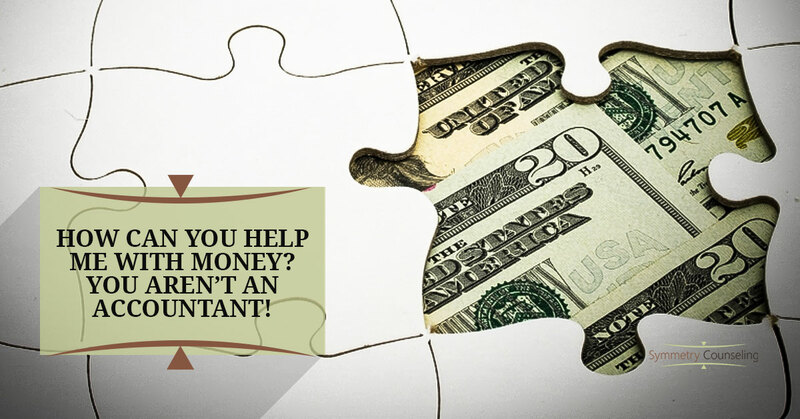 You Aren’t an Accountant! When I tell people that I am a Certified Financial Social Worker, the typical response I get is, “How can you help people with their money issues? You aren’t an accountant or financial planner.” While this might be true – I do not have the training or credentials to give financial or investment advice, create detailed budgets or plans, or offer financial services – there is much more to having a healthy relationship with money than those tools. A good portion of the population have healthy financial behaviors and relationships with money and often think that spending money is just a black and white business transaction completed without significant emotional reaction or impact. Unfortunately, this is not the case for everyone. There are times when significant negative cognitive, emotional, and psychological aspects related to money are present which can create detrimental financial behaviors and sometimes lead to serious negative consequences without help from a counselor. Buying something for oneself or others every so often can make people feel pleasure or gratitude. It can become dysfunctional when it turns to compulsive buying where shopping binges are often used to try to make one feel better, relieve stress or discomfort, or provide relief from negative feelings like anxiety or depression, which often leads to guilt or remorse. Having a good work ethic and wanting to be financially stable while maintaining a work life balance is ideal. It can become dysfunctional when one is fixated on earning more and more money, working substantially more than is required or expected, and prioritizing work to the detriment of one’s physical and mental health needs and one’s personal life. This is often referred to as workaholism. Keeping material possessions due to their function/need or sentimental value and saving money is typical and necessary. It can become dysfunctional when one is not able to part with accumulated items or spend money. This is classified as hoarding when one has significant difficulty parting with possessions due to a perceived emotional attachment or financially when one has a fear of losing or spending money. There are several other money-related disorders, such as financial denial (problems are minimized or avoided), financial enabling (inability to say no to others financially), financial dependence (reliance on others financially), financial enmeshment (lack of boundaries in financial aspects, primarily in parent and child relationships), and financial infidelity (secrecy and dishonesty related to money). As a Financial Therapist, I work with clients to help them identify and understand their money scripts and how they are impacting their financial behaviors and lives. Money scripts are people’s attitudes and beliefs about money, which are often developed in childhood, are typically unconscious, and play a significant driving factor in financial behaviors. Money scripts are usually classified as money avoidance (avoid dealing with money and reject responsibility), money worship (belief that more money means more happiness), money status (view own self-worth based on net worth), and money vigilance (overly alert, watchful, and concerned about money). With the use of various therapy techniques, such as Cognitive Behavioral Therapy or a Strengths Based therapy approach, one is able to better understand the underlying beliefs and motivations behind their thoughts and actions and it can then be possible to create more positive thought processes and patterns, financial behaviors, and “re-write” one’s money scripts for improved mental health. If you feel you have a negative relationship with money or display negative financial behaviors, please contact Symmetry Counseling today to make an appointment with a Financial Therapist who can help.